I'm having the same experience with Husson's brigade and I did with Campi's - I misread the General de Brigade orbat and have given the 61st Ligne two battalions and the 3rd Ligne only 1 (it should be the other way around), and I've painted the 61st backwards. This is the second battalion officially; in fact it has a third battalion fanion, simply because GMB sell these fanions in packs containing one second battalion flag and one for the third battalion - given that there were only a handful of French regiments at Waterloo which fielded 3 battalions I will end up with lots of redundant red fanions unless I put them to use. As with my other French battalions, this one is a mix of Perry plastics and metals. There are more of the former than the latter and the plastic figures incorporate several of the spare heads that are included in the box. This is an excellent idea and I hope the forthcoming plastic Prussian sets from Perry and Warlord have plenty of spare heads too. Ideally I'd have liked another couple of flank company heads (i.e. 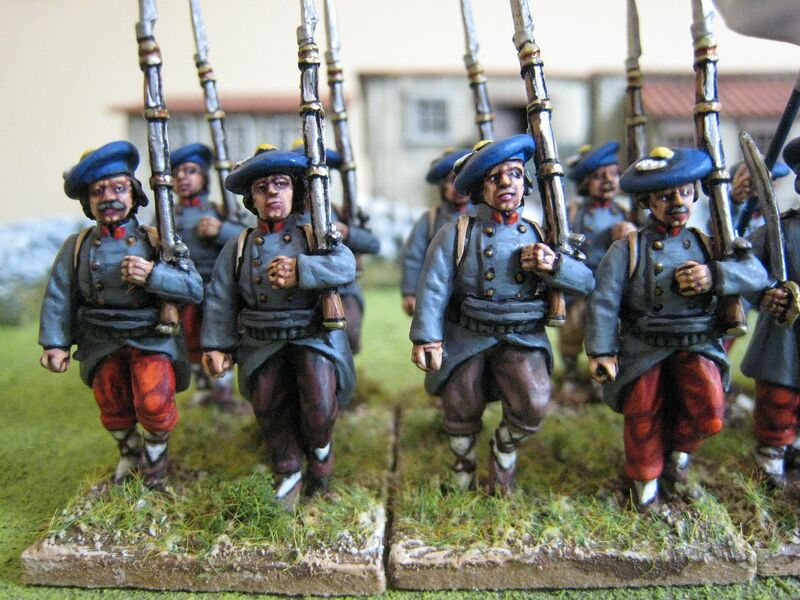 with moustaches), as my grenadier and voltiguer companies always seem to look the same. Anyway, the front rank of this unit mostly have head swaps. I was worried that the drummer's new head might make him look older than the stereotypical "drummer boy", but I think it's turned out ok and in any event I confess I have no idea about the average age of Napoleon's infantry drummers - I suspect it wasn't quite as young as one might think. The skirmishing voltiguers are based on the bases that come with the Perry box, only with the green edges painted mid-brown. I've started the 61me's first battalion, but won't finish it until later in the year. Last night I put together a couple of Perry plastic cuirassiers and and tempted to paint those up to see how they look. I'm aware that a unit of 18 French cavalry will take most, if not all, of September to do, so I'm not sure that I'll manage a whole regiment, but you never know. Next up will be some foot artillery and Baron Campi. 28 figures. Painted August 2010. Fanion by GMB. Apologies for the lack of posts. There is quite a lot on the basing table, as the photo shows. This should all be coming in for photographing over the next couple of days. Also completed is the Baron Campi figure as brigade commander for my first completed 1815 French brigade. The second brigade is underway - one battalion finished (above) and another started last week. I thought I might take a month-by-month approach with my various periods and see how it goes. August has been an 1815 month and next month will be either First Carlist War or AWI - I need to see what's in the leadpile for both periods; cavalry mainly, I suspect. Despite the Perries releasing tempting goodies every month (for the AWI it was French artillery in August and Lauzun's Legion in September) I am trying to refrain from buying any new figures until the lead and plastic piles are reduced. Some of my AWI leadpile, specifically a few militia packs, is in hibernation while I wait to see if Alan Perry produces anything else to go with them (such as the "northern" militia figures I saw a couple of years ago). In the meantime there is plenty to be getting on with. This unit represents the 108th Line regiment at Waterloo and completes Campi's brigade in Bachelu's division of Reille's II Corps. I have been following the order of battle available on the General de Brigade website, but mixed up the 72nd and 108th Line regiments - I gave the former two battalions and the larger only one, when in fact it's the 108th that has the two battalions. Idiotically, I've just make the same mistake with the two regiments in Husson's brigade...Anyway, the orbat has the battalion at 30 figures. The brigade skirmishers number 12 figures and I have divided those equally between the 72nd and 108th (in fact I gave each battalion of the 72nd 4 skirmishers, to I have 2 left over). This means that the 108th does actually have 36 figures, a "full strength" French line battalion. As I said a couple of posts ago, I had a sudden urge a couple of weeks ago to paint some more French infantry for 1815. 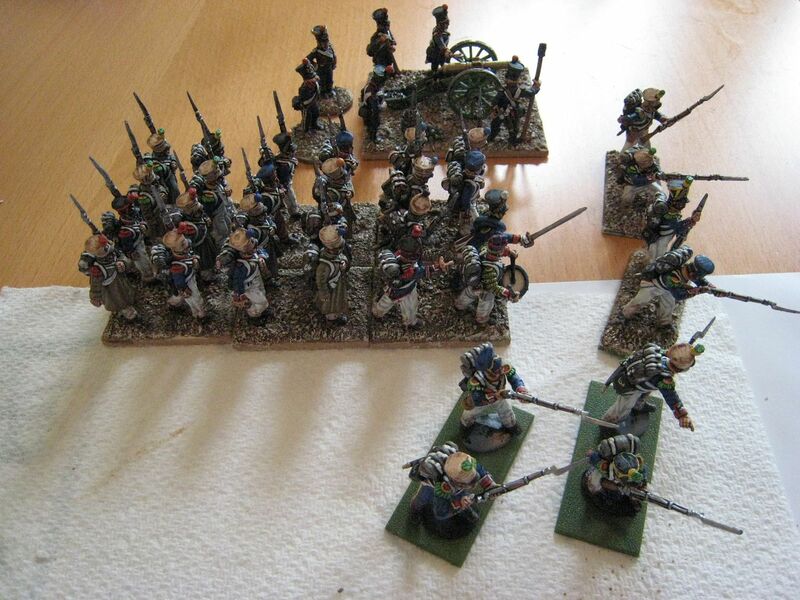 I painted two 6-figure stands of the Perry metal French infantry years ago when the figures first came out, and it seemed sensible to add to those and make a full battalion. Those earlier figures were painted in a rather different style (the faces in particular) and I add to continue a couple of "mistakes" in the uniform to ensure consistency - so, for example, there are no "N"s on the cartridge case flaps. The command stand comprises the figures from the metal regimental command pack, save for the standard bearer which is from the plastic box. A problem I had not appreciated would arise is that the plastic eagle pole is too short to accommodate a GMB flag. The metal eagle in the metal command pack is fine, but for some reason the plastic one is shorter; I've no idea why this is the case and it's a bit annoying as it means you have to increase the pole if you want to use GMB flags (which are larger that the freebies that come in the Perry box). I foolishly tried to attach a bit of steel rod by cellotape and it looks rubbish, so I'll need to change that at some stage. As I've said before, the Perry plastics are wonderful figures to paint - very easy to do, with excellent detail and good, natural poses. There are a couple of metals on the skirmish stands (the bases of which are from the Perry box). I'm just over half way through the next unit, the second battalion of the 61st Ligne. When that's finished I might paint Campi himself and an artillery crew and then return to the AWI or Carlists for a bit. 36 figures. Painted January 2007 and July 2010. These troops are my first formed unit of Carlist troops, supporters of Don Carlos and opponents of the Christino/Isabelino regime. In contract to the Isabelino troops which included most of the Spanish regular army, Don Carlos' supporters were volunteers, largely recruited in the northern provinces of Spain. 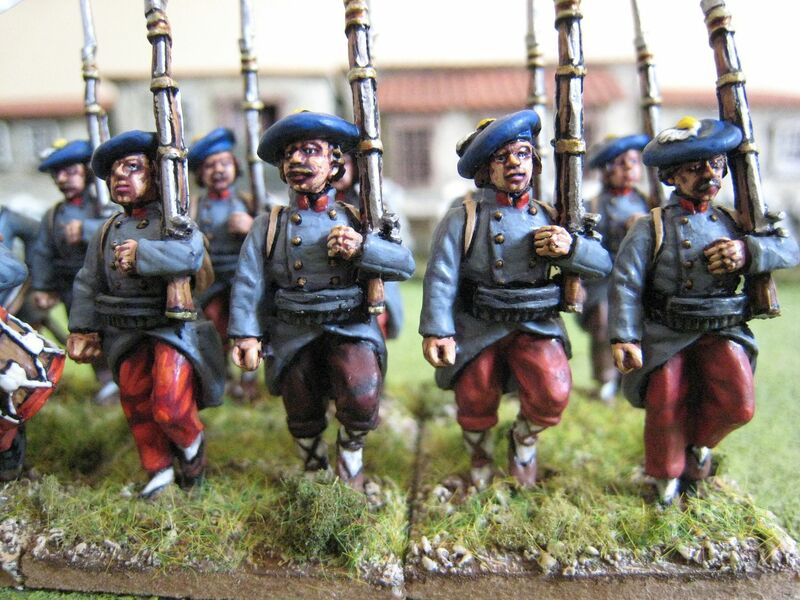 These are painted as a battalion of Guipúzcoa infantry from the Army of the North. Guipúzcoa is a province at the very north of Spain on the Bay of Biscay. 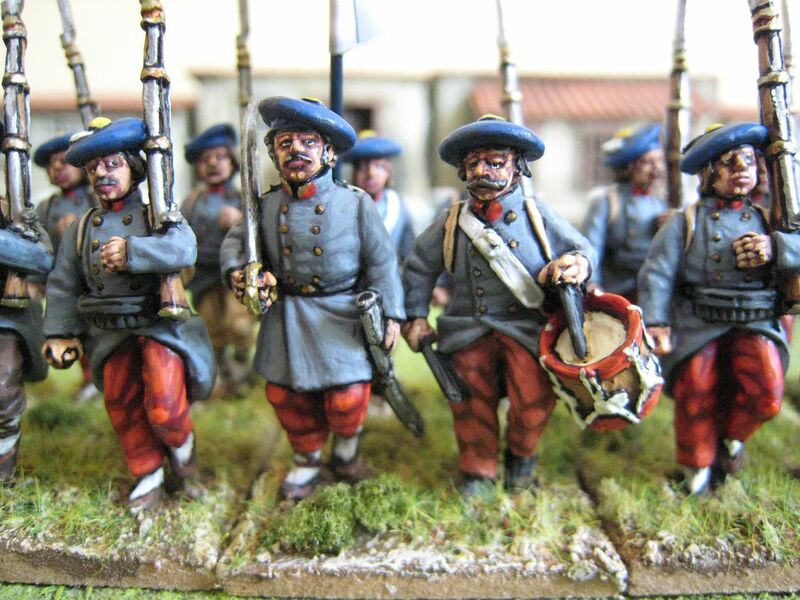 The Basque country generally was a Carlist heartland and saw much heavy fighting - the British Legion operated in this area around San Sebastian and Hernani, so painting up some Guipúzcoa regiments seems a logical place to start with the Carlists. I intend to do 4 such units - 2 marching and 2 firing. 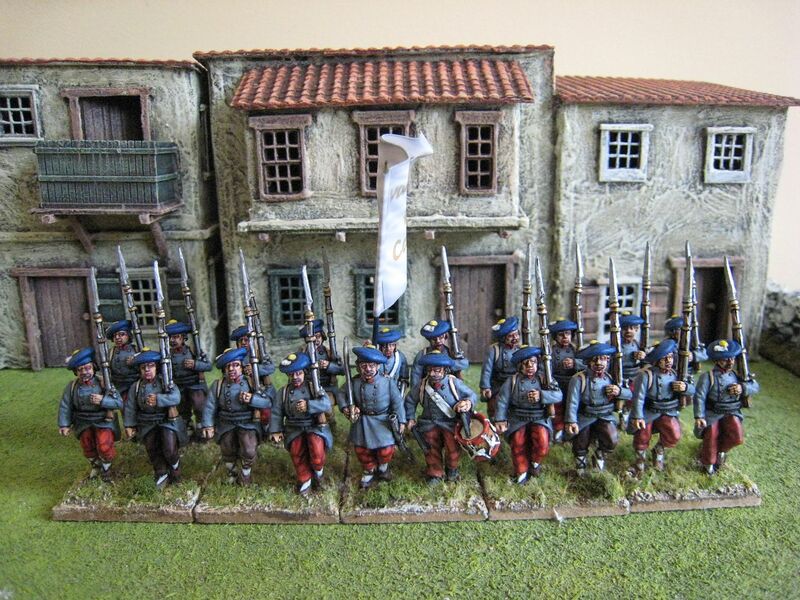 As with my Isabelino regular army battalions, Carlist units will comprise 20 figures. I have seen some references to Carlist battalions being larger than their Isabelino counterparts, but given the absence of easily-accessible combatant numbers for the battles of this conflict I decided at the outset to standardise unit numbers at 20 figures, save for those units that are known to have been of a particular size (e.g. the Isabelino militia units). 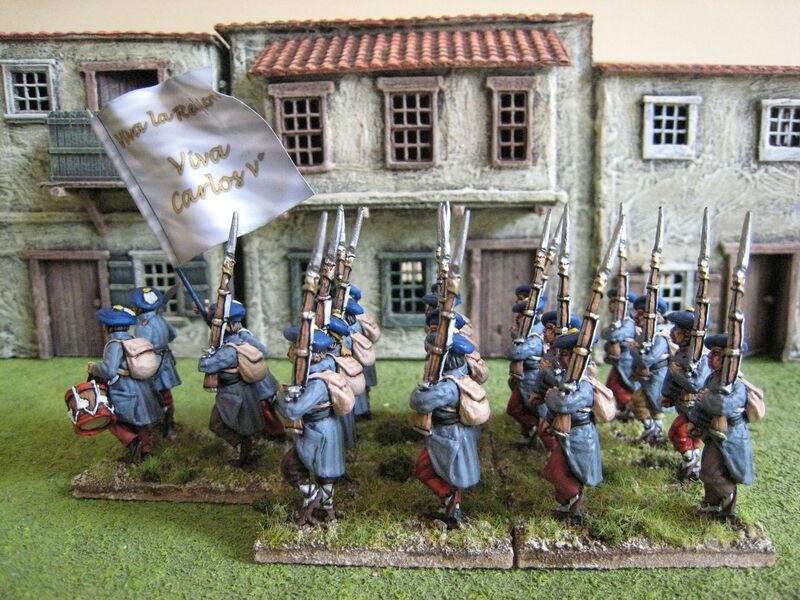 I decided to use the same colour scheme that I used for me trial Carlist skirmishers earlier in the year. 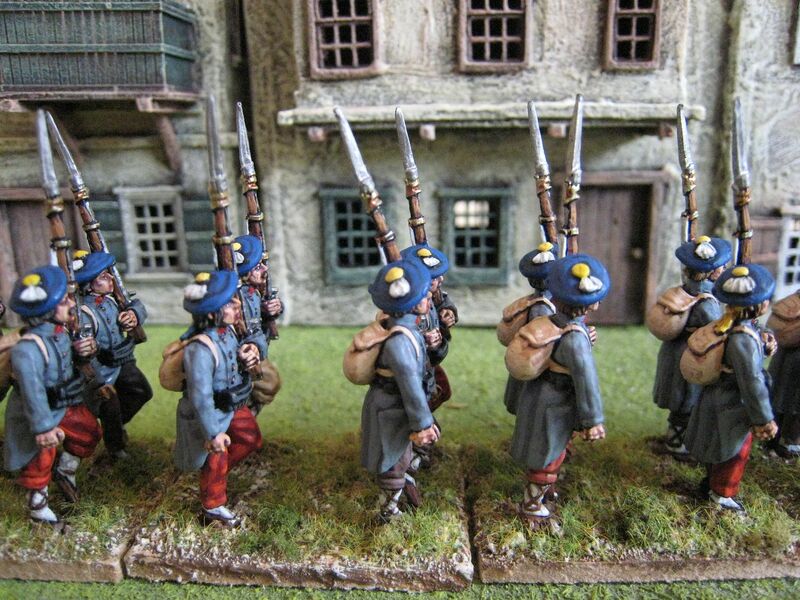 So the greatcoats were painted with Foundry's "German Late Field Grey 78" palette, the berets with "Deep Blue 20" and the trousers with a variety of reds and browns. I kept these figures looking quite smart - other Carlists units will have lots of parches, worn clothes and stubble. The buildings in the background are by Touching History. I picked up a box-load of generic Mediterranean buildings a few months ago; useful for Spain, Italy and probably a few other places as well. I note that Tablescape have released some more items in their ready-painted Mediterranean series, which I will pick up at some stage. I will then have enough buildings for two villages/towns, which will be sufficient for most Carlist War engagements. The flag, as usual, is from Adolfo Ramos (obtainable in the UK from North Star). The Ramos range is expanding into lots of other periods and the quality of the flags is getting better and better. I am trying to speed-up my painting at the moment. I confess I have been seduced by Napoleonics and am having great fun with the Perry plastic French infantry. As I've said before, when you get a sudden urge to paint a particular period, you just have to give in and go for it - you never know when that urge will return (I last painted Napoleonics in 2008!). My rule of not being able to buy any more Carlist War figures until I have completed the ones in the leadpile means that the next Carlist War offerings will have to be British Legion cavalry or more Isabelino infantry. If readers have a preference, then please let me know as I'm having trouble deciding! 20 figures. Painted June/July 2010. Flag by Adolfo Ramos.